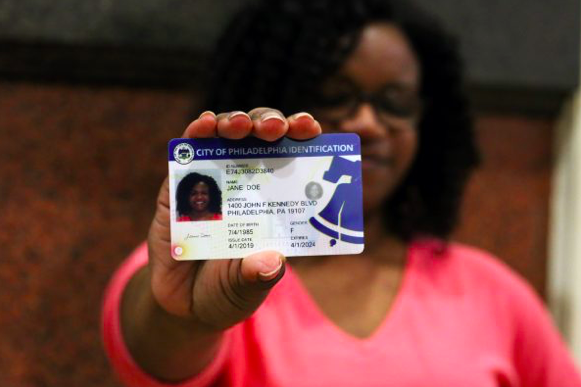 Philadelphia residents can now obtain a city-issued photo ID that permits them to access a variety of city services and buildings. The city of Philadelphia is officially offering an alternative form of identification for residents who don't have driver's licenses or other forms of photo ID. The new PHL City ID offers an affordable option for residents who are at least 13 years old and can provide documentation to prove their identity and permanent address. The PHL City ID is not a substitute for the Pennsylvania REAL ID, which is now available at local DMVs and pertains to air travel and federal building access. To qualify for a PHL City ID, residents must provide documentation that meets the city's four-point system. Nearly 70 documents outlined in the following guide can be used to prove one's identity and Philadelphia address. Residents will have to set up an appointment to get a PHL City ID at the Philly311 walk-in center at City Hall, Room 167. Hours are Mondays from 1-4 p.m., Tuesday-Friday from 9 a.m.-4 p.m. and limited walk-ins on Wednesdays from 9 a.m.-4 p.m. The PHL City ID team will also host mobile pop-up events with some evening and weekend hours. Appointments are expected to take between 15 and 30 minutes. The cost will be $5 for residents between 13-17 years old, $10 for residents between 18-64 years old and free for everyone 65 and older. Purchases must be made with cash or money order until May, when debit and credit card purchases will be accepted with a $1 fee. This application for the PHL City ID can be filled out in advance of the appointment at City Hall.